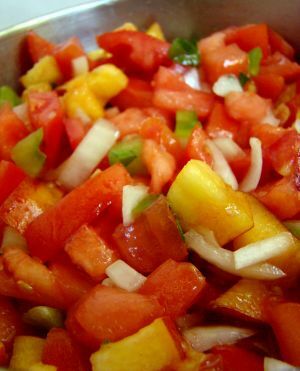 In a large bowl, combine peaches, tomatoes, chiles, onions, and avocado. Stir gently to blend. In a small bowl, whisk together olive oil, vinegar, cilantro, and the citrus juices. Pour over the vegetables and toss. Serve with tortilla chips. Blue corn chips are even better, and look great! Prepare a large non-reactive bowl with water and ice. Bring 6 inches of water to a rolling boil in a large stock pot. Cut a small, shallow X on the bottom end of the tomatoes (opposite the stem end), barely piercing the skin. Carefully place the tomatoes into the boiling water for exactly one minute. Remove the tomatoes from the boiling water and drop them into the ice water. Allow the tomatoes to cool completely. You can now easily peel the skins off the tomatoes.